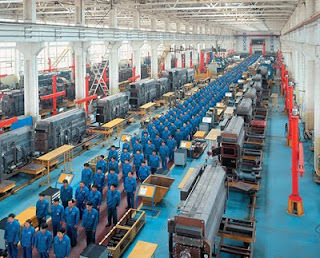 As Chinese manufacturers begin to raise wages, many speculate that the cost of goods worldwide will rise and China's manufacturing base will shift away from low-end products. Pietra Rivoli, a professor of international business at Georgetown University and the author of “The Travels of a T-Shirt in the Global Economy,” says the effects of rising labor costs will vary by industry, perhaps with lower-valued goods like garments being forced to move to western China or even to Vietnam and Bangladesh. But she says high-end electronics like smartphones are likely to remain, because they command high profit margins and because China has built a sophisticated infrastructure and quality-control system. However neatly China can adjust its economy away from an export-based economy and towards more internal consumption, the "externalities" of global industrial supply and demand are taking a noticeable toll on the population. Since last year, there has been an explosion of lead poisoning cases close to smelting plants. Studies have shown that communities that recycle electronic waste are exposed to cadmium, mercury, and brominated flame retardants. Elsewhere, there have been protests against chemical factories that are blamed for carcinogens that enter water supplies and the food chain. But whether China can even sustain its economic growth remains to be seen.